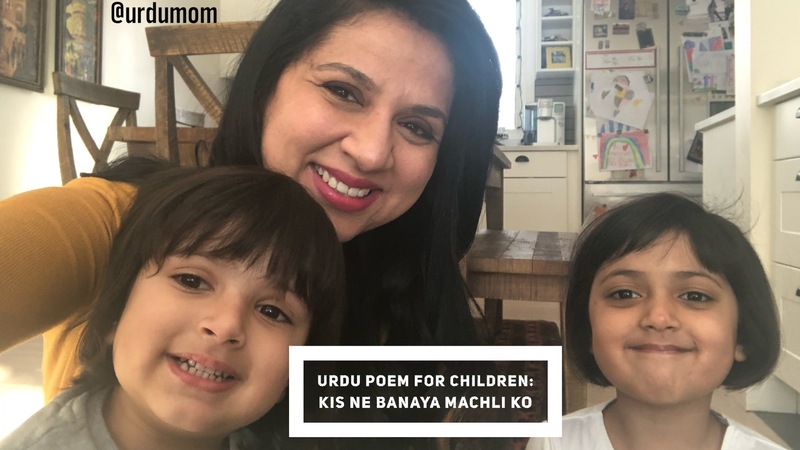 “Kis ne banaya machli ko” is one of the fun Urdu poems for kids that I used to sing at school as a child myself and now love it when my children sing it with me. We used to sing this song at our school assembly and it brings many fond memories for me. This song becomes interesting for children with fun gestures that you can follow from our video above. Hussein joined us for the first time in this video and it was quite an interesting experience. While it was difficult getting him to sit in one spot, his enthusiasm was quite infectious. We hope to have him in more of our videos as a lot of you requested it! You can use this poem to build your child’s Urdu vocabulary. This is an engaging and interactive song to develop the interest of young children in Urdu. You can extend this song to follow any theme such as animals or a specific Urdu alphabet. Do check out www.urdumom.com/urdu for lots of Urdu resources for parents and teachers including Urdu poems, games, crafts and activities.